I told you yesterday that Kelly Jo's Dad had made a lot of progress on the painting in the house. Wow! It looks so good! 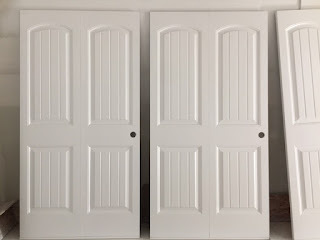 Tuesday he put the finish coat on the doors. 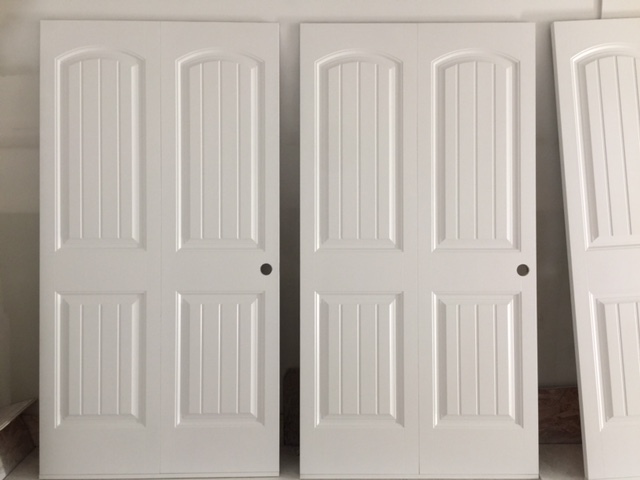 There are four 42" pocket doors, three 36" pocket doors, a 36" pre-hung closet door and a set of 48" french doors for a closet. They are ready to be put in place. I hope to do that this morning. The doors look great. The walls look great. AND the cabinets look super great! As you can see, Odie chose for the upper cabinets to be white, the base cabinets to be gray and the island to be blue. The wall color is Icicle. It look more blue in some light and more gray in other light. Contrasted with the white ceiling and the cabinets, the wall color looks fantastic. Kelly Jo and Odie have done a fabulous job with design and Danny brought it to life. Odie is going to owe him a bunch of ice cream for life! He also put a finish coat of white on the corner bench I built in the kitchen as a dining area. It is really amazing to witness the progress we have made in a few months. We could not have made it to this point without the help of God's people. We thank you for it and we thank God for it. I hope to work on a few things this morning and then I will turn my attention to preparing to hit the road toward Richton, Mississippi.